Former ONE World Champion Joshua “The Passion” Pacio gets a chance to avenge a shock loss and regain the world crown he lost last January 19 when he faces reigning ONE Strawweight World Champion Yosuke “The Ninja” Saruta of Japan at ONE: Roots of Honor on April 12 at the Mall of Asia Arena. The bout will be a rematch of their duel at ONE: Eternal Glory where Pacio lost his crown via a bitter split decision. In the main event, reigning ONE Featherweight World Champion Martin “The Situ-Asian” Nguyen of Vietnam and Australia defends his title against former ONE World Champion Narantungalag Jadambaa of Mongolia. The 29-year-old Nguyen has become one of the most prolific Asian martial arts talents over the past few years, winning seven of his last nine contests. In 2015, he embarked on an unprecedented six-bout winning streak. Along the way, he captured both the ONE Featherweight and ONE Lightweight World Titles to become a simultaneous two-division ONE World Champion. After falling to injury, however, Nguyen was prompted to vacate the lightweight belt in September 2018. 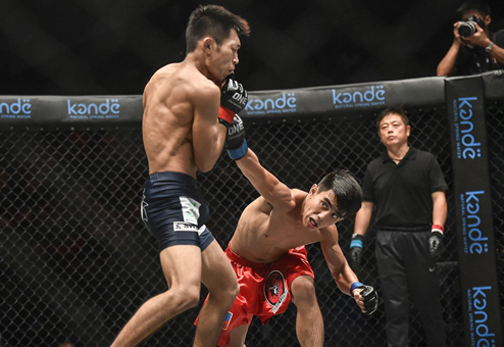 Jadambaa burst onto the ONE Championship stage in May 2014 by defeating former ONE Featherweight World Champion Honorio “The Rock” Banario of the Philippines. He has since won six of his last eight contests. In 2014, he captured the ONE Featherweight World Title with a victory over Koji Oishi. Over the years, Jadambaa has defeated some of ONE Championship’s biggest names, with notable victories coming over Kotetsu Boku, Kazuki Tokudome, and Eric and Edward Kelly. Pacio gets a chance to avenge his shock loss to Saruta. After Pacio’s original opponent, Hayato Suzuki, was forced to withdraw from the bout due to injury, Saruta who was tapped to take his place in the main event opposite the Filipino. Using his world-class striking and grappling skills, Saruta put together a comprehensive performance to capture the belt. The extremely close result was enough to warrant an immediate rematch between the two. Now, Pacio and Saruta have the chance to settle the score once and for all to determine who is the true king of the talent-filled strawweight division. Issa, who represents Evolve in Singapore, is a winner of three of his last four bouts, which includes two exciting finishes. Meanwhile, Fu, who is a boxing, wrestling, and taekwondo specialist, has won his last five bouts, which includes three stoppages. The two streaking martial artists are on a collision course and should provide fans with an intriguing match-up.